… let your shout of Hosanna be for joy. He has come to save you. In the Hebrew use of words, the word ‘daughter’ is not just used for a female child, it is also used collectively for the inhabitant or citizens of a place, particularly in the text citizens of Zion or Jerusalem. The call was to the embattled citizens of Zion. It was for them to rejoice and shout and to behold because help has come. To behold is an expression of surprise and a call to look so as to see what is currently not within the horizon but coming into view. It is a special appearance, that those concerned need to lift their heads up to see. Coming into view is the King of the citizens of Zion, the righteous one of Israel, who comes to His people with salvation, to provide freedom and succour, to avenge and defend, to rescue and preserve. He that is coming is incidentally lowly in appearance and riding on donkey. A meek and lowly appearance that veil the help He brings. He that is coming is able. He comes to put an end to war and to cut off the tools of war both gathered against you and emanating from you. He is coming to speak peace not just to you and your situation but also to the nations, wherever they yield and submit to Him. He shall reign from sea to sea and to the ends of the earth. Christ is interested in delivering His people from sin and granting them victory over troubles. He wants to heal, bless, and help them beyond what legalism could conceive. 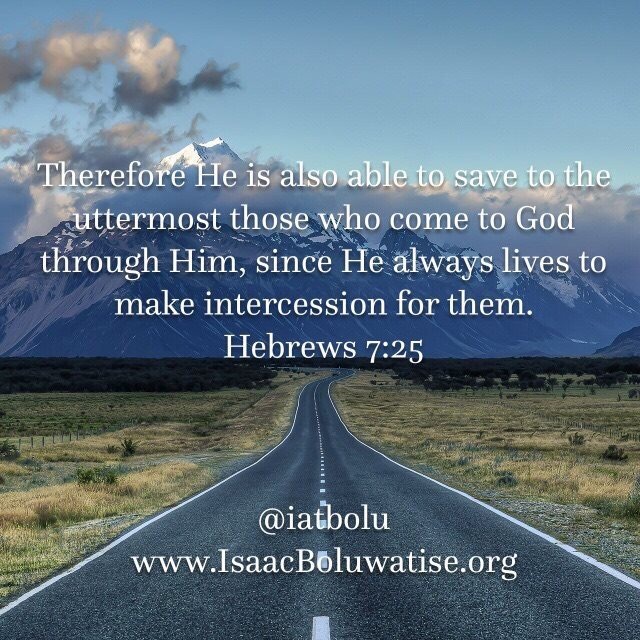 He has come to save from all embattlements; limitations; inabilities; and hopelessness. His approach however is subtle that the help he brings may be written off. The choice of how He appears in your situation is not within your control. It is without pomp and pageantry, noise and shakings, as you would have ordinarily expected. He has provided salvation by the blood of his covenant. The blood which binds him to as many as would receive His offer and help. There is power in His blood. It is a wonder working power; it is a burden removing power; it is a victory providing power; it possesses such power that could only be from the precious blood of the lamb of God. Let your heart be encouraged and cognisant that you can still believe in hope against all hope. You can rebuild your hope on Jesus blood and righteousness. You call look away from all lying frames or lying vanities. You can lean entirely on Jesus name. I came to charge you to desist from pursuing wells without water and clouds without rain (2 Pet. 2:17) and to call you to return to the stronghold. The name of the Lord is a strong tower – (Pro 18:10). I am calling you to become a prisoner of hope – one who cannot be bound to the situation he is in but to the future he hopes for. Turn to the stronghold, the place of strength, for today I will restore to you double. I will deploy you even when you feel useless; I will use you in a significant way; I will honour you so much that you will find your honour in my honour, says the Lord. Prisoners of hope do not mourn, weep, nor sorrow. They only rejoice. The key to their joy is in beholding their king’s coming with full persuasion of what he can do. Do not be disillusioned because he is riding on the foal of a donkey. Some may trust in chariots … We will remember the name of our Lord (Ps 20:7). Remember the triumphant entry of Jesus into Jerusalem and His victory over death, hell and grave and let your shout of Hosanna be for joy. He has come to save you.